The MSGBC Basin: Where is the Next Hydrocarbon Discovery? TGS database in the MSGBC Basin. The MSGBC Basin has been the shining light of African exploration through the recent darkness that the industry has endured. That light, or rather floodlight, was cast upon the region through the recent world-class discoveries in Senegal and Mauritania. The MSGBC Basin is named after the acronym of the countries in which the basin (or more accurately a collection of mini sub-basins) resides, namely Mauritania, Senegal, Gambia, Guinea-Bissau and Guinea-Conakry. Also, just for completeness, the basin includes the AGC joint maritime zone, which sits between Guinea-Bissau and Senegal following a collaboration agreement between the governments. The location of the Basin is shown on the map (right). The benefit of a regional dataset can be seen on the seismic foldout. This arbitrary 2D composite line spans from Senegal through The Gambia and back into Senegal concluding in AGC. It passes very close by FAN-1, the SNE field, close to Jammah-1 and the Samo-1 well location in The Gambia, as well as tying to Wolof-1 in Senegal, before finally tying CM-10 in AGC. The variation in the structural style and ability to interpret regionally is obvious. The MSGBC Basin is ready for something new to help analogue-chasing the next SNE oil field. Prior to 2014, with doubts over the actual commercial success of Chinguetti in Mauritania, there was only sub-commercial success in the MSGBC Basin, proving the working petroleum system but not providing evidence that commercial quantities of hydrocarbons could be produced. Then FAR, an Australian exploration company, came along and rewrote the basin in the annals of history when they successfully farmed out their Sangomar Deep licence to ConocoPhillips and Cairn. Figure 1: The importance of an accurate depth migration is clear. Top: PSTM line through SNE-1. Bottom: PSDM line through SNE-1. FAR had acquired 3D data and worked up a beautiful story with supporting seismic evidence of a prospect, Lupa Lupa, which had pre-drill P50 estimates of 154 MMbo. The name translates as ‘butterfly’ in the local Wolof language – which only built on the vision sold to the industry. Upon drilling, the prospect did indeed metamorphose into the largest discovery of 2014 – the SNE field. Subsequent appraisal drilling has now yielded 2C contingent resource of over 641 MMbo, according to a recent FAR investor presentation. 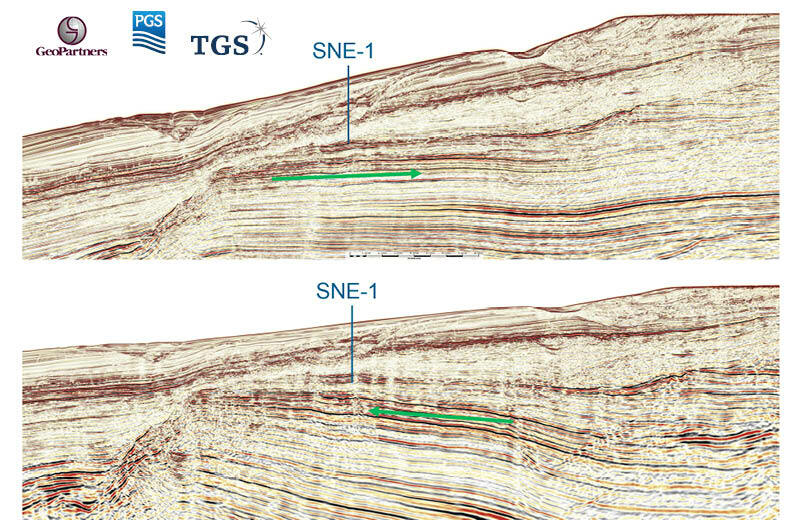 Just before drilling SNE, the exploration team had drilled the FAN prospect, located basinwards, downslope and outboard of the palaeoshelf location of SNE (see Figure 1 and foldout above). Whilst the Cairn Group were having success south of Dakar with the SNE and FAN oil discoveries and subsequent appraisals, Kosmos were having their own triumphs farther north in Senegal and Mauritania. Tortue-1 (French for turtle) was the largest global thermogenic discovery in 2015, intensifying the light thrown on the region by the earlier drilling. The success of the Tortue Complex (which straddles the international boundary between Mauritania and Senegal) was attributed to the huge 3D seismic volume that Kosmos had acquired and interpreted. ‘Postage stamp’ 3D is good for working up drill-ready prospects but regional 3D enables a more holistic understanding of the complete petroleum system and hydrocarbon potential. After appraising, the P-mean gross resource estimate for the Greater Tortue Complex is now more than 25 Tcf. 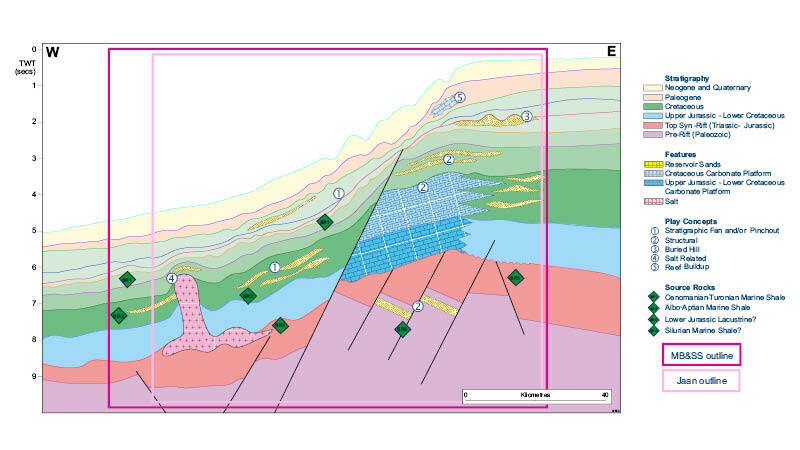 Figure 3: Geoseismic section showing the various play types that will be covered by Jaan and the MB&SS programmes. Following the giant success of Kosmos, BP joined their party and became operator in December 2016. The group continued to build upon previous drilling, and leveraging the large ‘exploration’ 3D that Kosmos had had the foresight to acquire led to the world’s largest discovery of 2017: Yakaar-1 in northern Senegal, with current resource estimates of 15 Tcf. 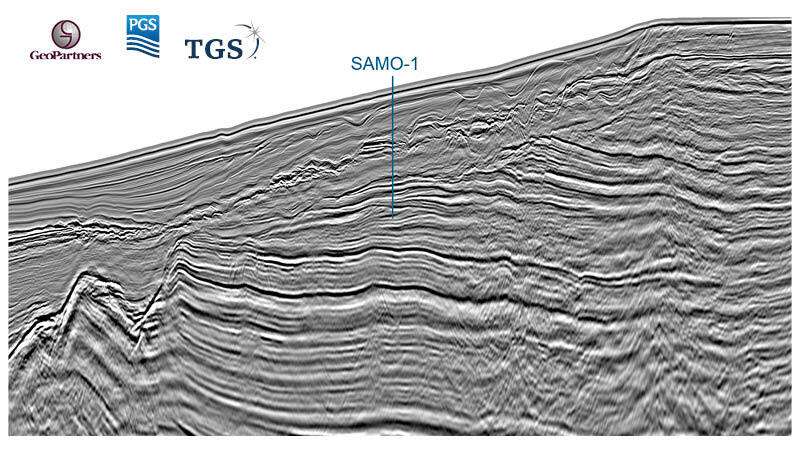 The next eagerly-awaited well is Samo-1 in The Gambia, the first to chase the SNE play beyond the Sangomar Deep Block, the location of which is shown in Figure 3. The success of this well could really open up the basin for more SNE hunting. It is operated by FAR with financial funding from Petronas, another large partner in the basin. TGS have been present in the basin since 2010, when they acquired a 3D dataset in The Gambia. After seeing the structures in the subsurface, a commitment to acquiring a regional 2D seismic dataset over the MSGBC Basin on the North West African Atlantic Margin (NWAAM) was easy to make. This 28,000 km NWAAM2012 2D seismic programme was a regular regional grid that tied the entire basin from Mauritania to the Republic of Guinea. The success of the sales profile has been largely attributed to three main factors: the cross-border connectivity which enables regional trends to be followed; the tying of the majority of previous drill locations, which provides empirical knowledge to interpretations; and finally, the current success the basin is experiencing. All three elements combine to make the MSGBC Basin a focus area for future TGS investment. Figure 2: PSDM line from the NWAAM2017 survey showing the location of the FAR/Petronas Samo-1 prospect. During the recent industry downturn, TGS, with key geological knowledge and a strong balance sheet, acquired 3D assets from distressed partners, quickly taking a prime position along the palaeoshelf-edge trend (PSET), ready for future pursuit of the next SNE. The NWAAM2012 survey was one of the last 2D surveys that TGS acquired in a standard acquisition set-up, as broadband deep-tow technology was not yet mainstream or accepted by industry partners at the time. This provided an excellent opportunity to infill the survey, decreasing the line spacing to roughly 7 x 10 km grid separation, with the NWAAM2017 broadband 2D survey, which has been processed to PSTM and PSDM, allowing subtle trapping angles to be seen across the basin. The SNE play comprises Albian sands sitting on top of a carbonate shelf incised by paleo-canyons and below present-day seabed canyons, creating a very complex and rugose terrain to image through. The reservoirs are charged by an early Albian source which produces 32° API oil that migrates basinwards to fill the structures. The migration path and trapping angle of the reservoir is subtle along the PSET, so an accurate depth velocity model needs to be produced to support future exploration potential. Figure 1 shows the SNE play from a dip perspective in both time and depth domain. This subtle rotation effect highlights the need for the depth processing. Learning from the giant discoveries and cross-border exploration success, whilst acknowledging the benefit that 3D brought to BP-Kosmos, TGS, in partnership with PGS and GeoPartners, have created a new dataset. The 28,000 km² Jaan 3D project will fill the gaps along the PSET where there is no current 3D seismic data and then process and harmoniously merge the new and existing data to create a fully phase, amplitude, time and depth-migrated 3D exploration volume to unlock the next SNE. When Jubilee was first discovered in Ghana in 2006 we saw the rush for analogue hunting. The industry chased ‘the next Jubilee’ for almost a decade with few positive results. By acquiring and processing Jaan, TGS hope to prevent such failures and ensure more astute exploration of analogous prospects. Jaan also has a Wolof name, in homage to FAR for their excellent efforts in persevering in backwater Senegal after 26 years of zero activity. It means Snake, as the PSET resembles a snake slithering down the NWAAM through the MSGBC Basin. TGS hope that by chasing the snake, future drilling can be located using regional 3D exploration seismic data underpinned by over 50,000 km of regional 2D seismic to provide basinwide ties. Jaan is being marketed as a low fee licensing model so that exploration 3D is affordable and great geoscience is not restricted by budgetary restraints. By working with four administrative bodies, Jaan will enable the geology to be fully understood and to allow better decisions to be made, unrestricted by international boundaries. To mitigate as much pre-drill risk as possible, TGS have recently funded a regional Multibeam and SeaSeep (MSGBC MB&SS) project covering the centre of the basin from northern Senegal to Guinea-Bissau. MB&SS has gained real technological ground in recent years with the advancements of MB tuning and backscatter analysis, which can now more accurately pinpoint seafloor sampling locations. In parallel with the refinement of backscatter anomaly mapping, coring location technology has also led to a paradigm shift forward. Seafloor samples can be cored successfully, with locations in water depths of up to 4,000m being retrieved from within 8m of the centre of the target zone. Source presence has been highlighted as one of the greatest play risk-elements perceived in the MSGBC basin by some exploration companies. TGS have performed basin modelling that produces positive answers based upon the previous drilling results and the basinwide interpretation. However, nothing can beat having real, physical evidence of geochemical analysis of samples retrieved from the seafloor. With new data being collected in this emerging frontier, TGS look forward to assisting in bringing future exploration success to the MSGBC Basin. 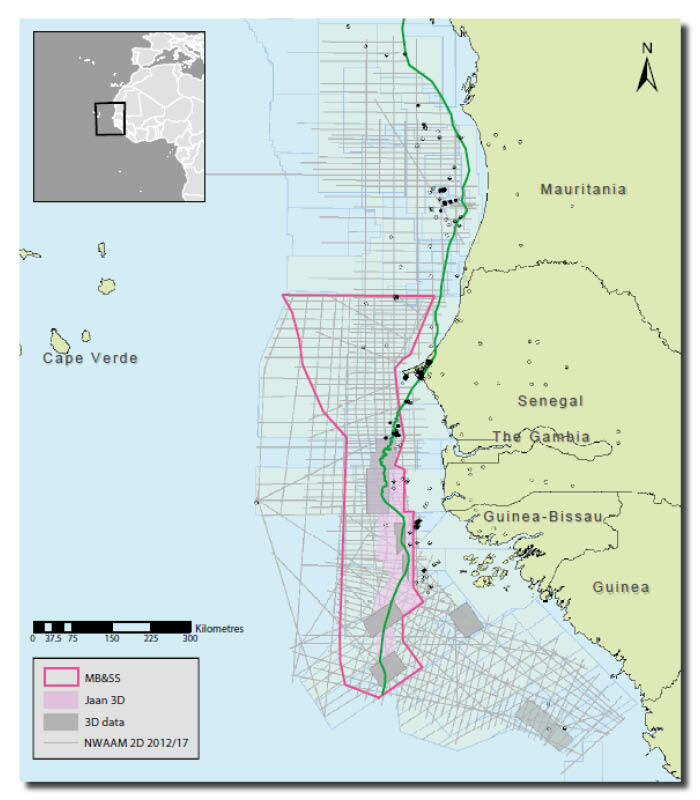 Some recommended reading of GEO ExPro articles relating to hydrocarbon exploration in Senegal.